The title of the exhibition holds at least three mysteries; who are the sons, who is the master and what is it he mastered so well? 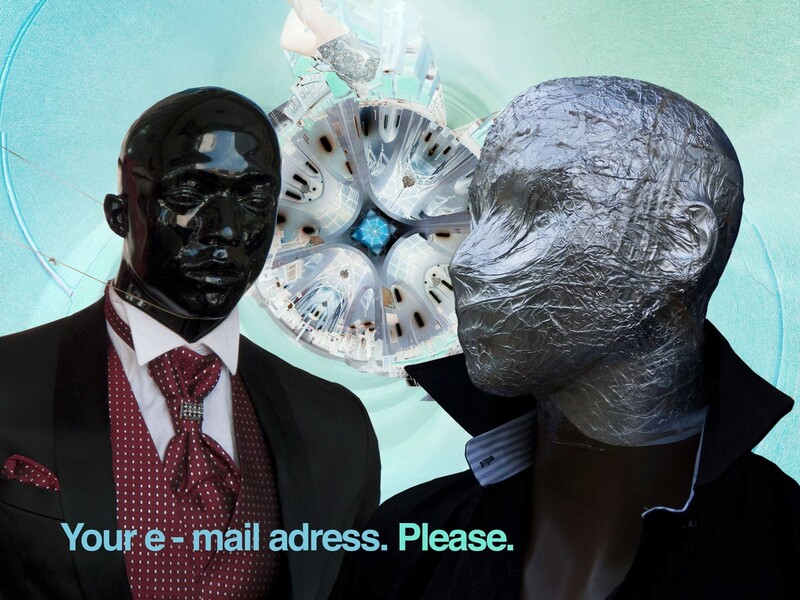 In order to answer these questions we will have to return in time. About a year ago, David Mzuguno – one of Africa’s greatest artists – organised a solo exhibition, showing an extensive series of his latest oil paintings at ISU. The exhibition turned out to be an overwhelming success. An enormous group of art lovers attended the opening event and students of different Ugandan schools and lots of individuals frequented the exhibition in the following weeks. The show was widely covered in the Ugandan press and was regarded – by the artist himself – as the biggest, most rewarding and most comprehensive ever dedicated to his work. The spotlights were on David Mzuguno, who at that point was widely regarded as the finest, greatest and ‘last living master Tingatinga painter’ of Tanzania. His art career spanned many decades and his international breakthrough was, a year before the ISU exhibition took place, nothing less than a fact. Artwork (c) Mzuguno Studio 2010. David’s work is rooted in the “Tingatinga style”, a distinct form of Naïve painting started by Eduard Saidi Tingatinga in Dar es Salaam in 1968. Tingatinga himself assumable had the shortest career in the history of the arts since it only spanned four years. He passed away after being shot by the police in 1972, but his students continued and spread his artistic legacy. The style recently gained importance on the international art market. A Tingatinga styled painting by the late artist Rajabu Chiwaya was on auction in Paris last month and sold for 51.000Usd. 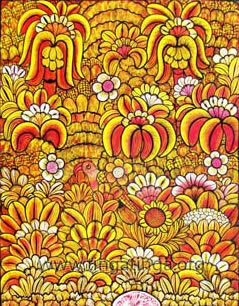 Today, hundreds of Tingatinga painters keep the vibrant and exotic style alive. Hordes of them are merely “bread painters” and only a handful of them managed to separate themselves from the crowd and receive international acclaim. George Lilanga and Damian Msagula, who both passed away in 2005, were two of the greatest. These great personalities added artistic personality and a highly individual expression to the style. They used the Tingatinga style as a carrier for artistic expression, but they developed their own distinctive visual language along the way. They changed and personalized the style, and were – like Mzuguno himself – true masters of Tingatinga. 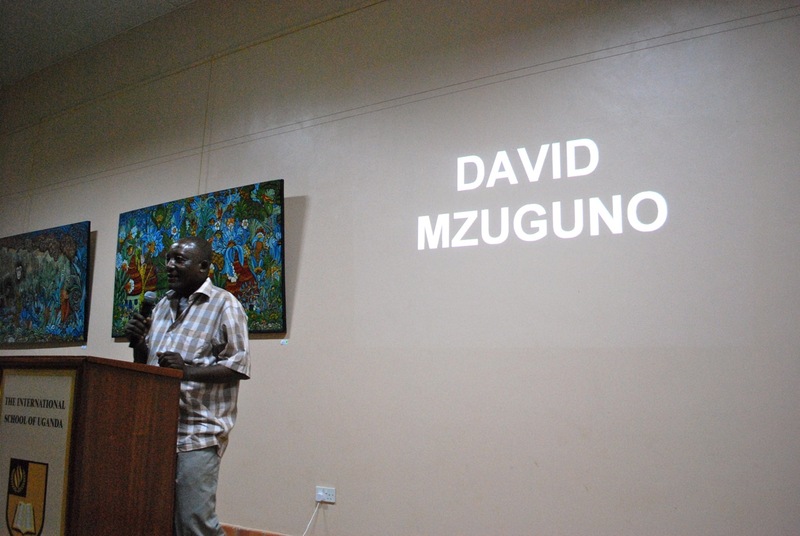 We were all honored to witness one of the most impressive contemporary African art treasures ever seen, at ISUs “Last living master Tingatinga painter-David Mzuguno-exhibition”. There were paintings of all sizes and colors. Elephants roaming through Eden’s garden. Traditional African villages hidden in tropical jungles, its inhabitants living in perfect symbiosis with their natural surroundings. Sensual zebras in love under trees filled with the brightest colored peacocks. Breathtaking views of mighty Mount Kilimanjaro. 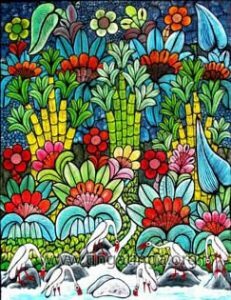 Lions staring at the viewer from a kaleidoscopic jungle forest, wildly decorated with an explosion of life-forms. Jungle scenes in rich gradations of yellows, oranges and greens, adorned with sunflowers in the most complex, yet stunningly beautiful painted composition schemes, wild, organically and delicate at the same time – like the forests themselves. Everyone loved the masterpieces that showed Africa’s wildlife in all its glory. Each single piece was a mad, abundant celebration of bio-diversity and electrifying natural energy, a refined artistic ode to the universal thirst for life and an embracement of pure naïve joy. It seemed as if a divine creative whirlwind had guided David’s brush over the canvas in order to visualise for us mortals the fresh primordial energy beaming straight from the inner depths of mother earth. It was clear that he lavished his artistic thirst from a never ending source of creativity and it just blew every single one of us away. No wonder all his work got sold, most of it even before the exhibition had officially opened. David, sadly enough, suffered lung cancer without his own knowing. He passed away in June 2010, shortly after the ISU exhibition. “I have taught four of my children to do art, and hopefully they will carry on with the business when I have left this world,” were Mzuguno’s visionary words he entrusted Sande Bashaija, a Daily Monitor-journalist, a few weeks before his death. The four children David mentioned in the article are Rashid, Juma, Kipara and Mchana Mzuguno. They have inherited their father’s talent, and they are now preparing for their biggest exhibition so far. They grew up by David Mzuguno’s side and have been his apprentices and assistants since childhood. Each of them became – through years of hard artistic labor – a true master of the style themselves. So far, they have painted 57 pieces. They continue to paint as we speak, since they aim to show more than a hundred artworks on the opening event of the Sons of the Master-exhibition. David Mzuguno's brother, wife and four children together with Pascal Bogaert. We are thrilled to welcome Rashid, Juma, Kipara and Mchana to the opening of the show. The exhibition will be introduced by curator Mrs. Katrin Klaphake after which Mr. Bogaert, ISU’s Visual arts teacher, will offer a lecture on the history of Tingatinga. Please be welcome to witness the Mzuguno artistic miracle once again. Pascal Bogaert is a dedicated painter and the founder of Real African Art Gallery in Zanzibar. 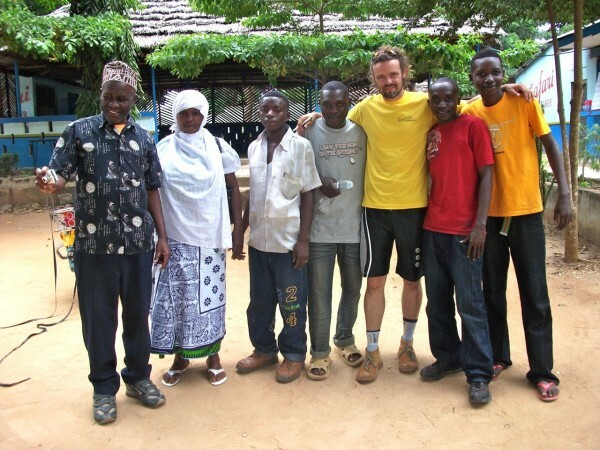 He has been an MYP and IB Visual Arts International School teacher in East Africa for the last twelve years. I love David’s work, but i think it’s a bit of a stretch to claim that he paints in the TingaTinga style. Perhaps you make this claim because TingaTinga, from Tanzania, is far more widely known than most other East African artists. But in your story you don’t even mention David’s nationality which I assume could be either Tanzanian or Ugandan. In this regard, he shares a regional affinity with TingaTinga, but if he is Ugandan that deserves to be mentioned in your story. Also, I had assumed that the triptych shown above was David’s art, but apparently it is not. So we are left wondering what David’s work actually looks like. Perhaps you could have included a few close-ups of his paintings to confirm your perspective on his work, which i am sure is lovely. Regarding the three images, I have now updated the article with caption text, which unfortunately were left out. Readers can view more artwork from Mzuguno Studio at http://www.tingatingastudio.com/09_tingatinga.html#MzugunoStudio. The spotlights were on David Mzuguno, who at that point was widely regarded as the finest, greatest and ‘last living master Tingatinga painter’ of Tanzania. David Mzuguno is regarded as one of the greatest Tingatinga painters of his generation and he himself declared Tingatinga as his ‘teacher’. Interview ‘Art in Tanzania’ dvd of Y.Goscinny, the ‘Tingatinga’ book of the same author, the website of the ‘Tingatinga arts cooperative society’ of Dar es salaam, etc,… gives sufficient proof of this. Thanks again for your interest and I hope to welcome you on Friday evening at the ISU. 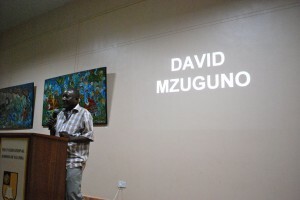 David Mzuguno does not belong to the traditional Tinga Tinga school, it is true. 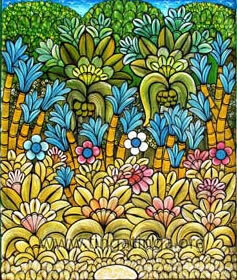 However he was painting at Tinga Tinga Cooperative in Dar es Salaam where he learned to paint in Tinga Tinga style. He later left the group. He uses elements in his art work from Tinga Tinga school such as enamel colours, black board and even traditional designs (in fact the black lines are found in every Tinga Tinga painting, even Msagula incorporated them in his art works). Earlier in his carrier he painted traditional Tinga Tinga paintings and later he found his own style. He himself maintained that Edward Tingatinga was his teacher though they never met. It was a spiritual meeting he refers too. This is such a powerful work- I wish I was there to witness it myself. I haven’t seen anything like it over here in Zambia (yet). All the best with the exhibition. The opening of the exhibition was an overwhelming success and it was sold out in thirty minutes only. The sons got a lot of orders to complete for those that couldn’t get a painting on the evening of the opening. They will return to Dar es salaam this week in order to complete all the work and they will be back in Uganda around the 26th of April. Thanks for showing up in such large numbers.